NEWPORT BEACH — After finalizing a more than 400 percent increase for Newport Harbor’s commercial marina owners, the city has set its sights on raising dock fees for waterfront businesses. City officials held a public workshop Oct. 31 informing business owners of their plan to increase the current monthly 36 cents per square foot dock charge by varying amounts, based on the type of business and how they use the docks. Restaurant guest slips, shipyard docks, fuel docks, yacht club docks and slips, sportfishing docks, nonprofit organization docks and small commercial marinas will all see rates rise in the new plan being put together by city manager Dave Kiff and the Committee on Harbor Charges — which includes city council members Mike Henn, Ed Selich and Steve Rosansky. Starting with a tripling of mooring fees for lessees in 2010, the city has been working its way through the harbor, taking a close look at fees and charges for various tidelands and waterfront uses. A 4-3 vote by city council members Oct. 23 effectively approved raising commercial marina rents in Newport Harbor from $.36 per square foot to an average of $1.97 per square foot over the next eight years. New fees for harbor businesses are scheduled to be discussed at the city council’s Nov. 13 meeting — and, if approved, a new fee structure could be implemented soon. The rates outlined during the discussion would increase dock fees for shipyards to $.50 per square foot. Yacht clubs with guest slips or non-rented slip space would increase to $1.02 per square foot — and those with rented slips would be charged the new 18.5 percent of gross revenue fee that was approved for commercial marinas. Fees for boat rental businesses’ docks, sportfishing charter docks and restaurant guest slips or docks would increase to $1.02 per square foot. 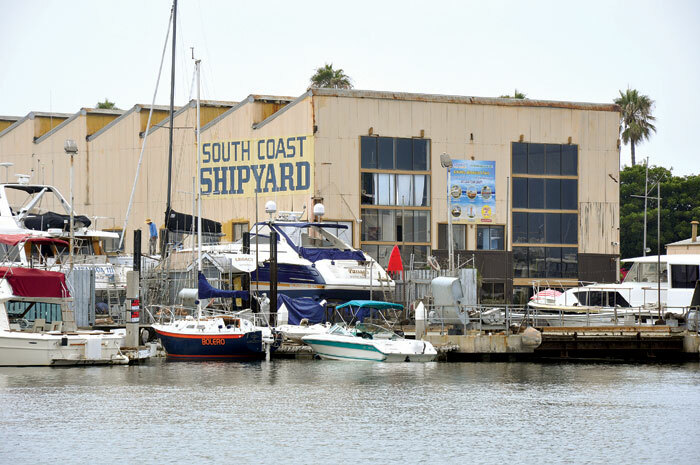 Nonprofit organizations, such as ExplorOcean (Newport Harbor Nautical Museum) would get no fee increase except for rented slips, on which fees would be assessed at the commercial marina rate of 18.5 percent of gross revenue. Small commercial marinas — a designation for facilities with 3,000 square feet or less of dock space — would get fees assessed at 13.9 percent of gross revenue: 75 percent of the rate large commercial marinas pay. Fuel dock operators would see a change in their monthly fee structure. They currently pay 36 cents per square foot. However, the proposed fee would switch to a per-gallon charge, starting at a 1.5 cent per gallon charge up to 100,000 gallons pumped, and a 2 cent per gallon charge on more than 100,000 gallons of fuel pumped. The newest proposal is based on the city’s two recent appraisals conducted to determine current fair market value for fees in Newport Harbor. With the majority of Newport Harbor’s tidelands belonging to the state, city officials have been contending that fees charged to businesses operating on public land must be at “fair market rates,” to avoid an illegal “gifting public funds” situation. Both appraisals found a fair market rent for commercial marinas to be the 17 to 22 percent of gross revenue range, with city council members finally deciding on 18.5 percent — an average fee of $1.97 per square foot — to be phased in gradually. Business owners and marina operators contend that the appraisals do not fully take into account the tenants’ responsibility to construct and maintain the marinas’ pilings, floats, bulkheads, parking lots and other infrastructure that go into creating a waterfront business. Balboa Ferry owner and Island Marine Fuel partner Seymour Beek said the fuel dock price increase was not in line with the planned fee increases for other harbor businesses. “I noticed in looking at the increases you’re talking about for the other businesses, rent’s going up by a factor of four — but the gallonage charge you outlined would put us at around seven times what we’re currently paying,” Beek said. He said the current fee structure would result in local fuel docks passing the 1.5 to 2 cent increase on to boaters who buy fuel. Other concerns raised included those of smaller commercial marina owners who did not meet the 3,000-square-foot facility minimum, who were to have been charged the same rate as large commercial marinas. Kiff said only a handful — four or five — marinas were identified by the city in the “small marina” class, and the possibility for expanding the small marina designation would be discussed at the Nov. 13 meeting. Yacht club representatives from Newport Harbor Yacht Club and Balboa Yacht Club also mentioned the fee increase scheduled for the club’s guest docks and non-rental space was too high, as much of the dock space is utilized for youth sailing classes, charity regattas, public sailing events, safety demonstrations and other uses that should be seen as a public benefit for harbor users and should be charged according to the nonprofit status of groups such as ExplorOcean. For the sportfishing charter fee increase, Newport Landing manager Capt. Mike Thompson spoke on how the charges would hit his business from multiple angles. “We’re in the unfortunate position of being tenants and customers,” Thompson said. He noted that the sportfishing fleet could be paying for their own dock fee increase, along with paying for other businesses’ dock fee increases that will be passed along to customers: 2 cents more per gallon for fuel and higher rates at the shipyard for boat repairs.